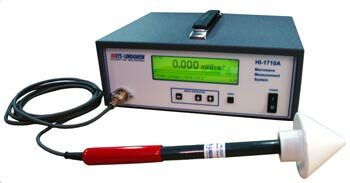 The HI-1710A combines the proven and reliable diode sensing technology of the Holaday Microwave Survey Meters with the digital processing techniques developed for automatic oven scanning. On power-up, the HI-1710A is automatically configured for normal production testing, relieving the operator of a complicated setup operation. Simply activating the Peak-Hold feature from the front panel and adding a serial printer results in a formatted RF leakage report each time the ZERO key is pressed. With the Remote Zero Option, testing and reporting are accomplished without reaching to touch the instrument or setting down the probe for even greater operator efficiency. The Remote Zero Chamber provides a location shielded from stray RF fields by simply inserting the probe. An optional alarm output contact transfer provides remote signalling capability (24 VAC, 1A). The separable probe/pre-amp assembly (HI-2623) means that daily ellipticity checks and periodic calibration checks can be made without removing the instrument from service. The RS232 interface allows easy adapting of the unit to computerized data acquisition in laboratory studies and semi-automatic production test systems. Digital Peak-Hold and Push Button Zeroing aid in improving testing productivity and reducing errors. Digital filters, selected from the front panel, provide the “Fast” or “Slow” responses familiar to analogue survey instrument users. Built in self-test sequences test meter performance at turn-on and each time the meter is zeroed. Diagnostic functions accessed from the front panel give quick indications of meter status.